Lillie O’Brien’s shop, London Borough of Jam, puts the treat in retreat. It’s a haven for foodies and lovers of good taste. 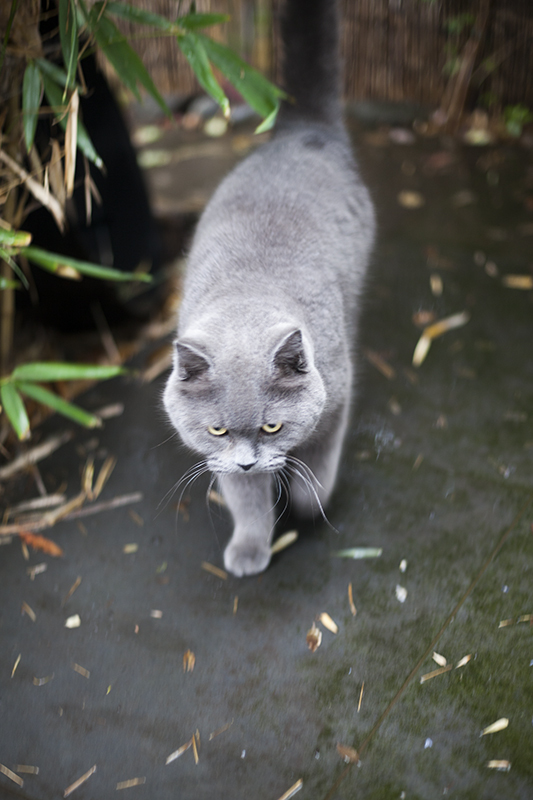 We chatted about creativity, flavours, and her fine feline, Chester. We love the name London Borough of Jam, but from your accent we can tell you’re definitely not a Londoner. Where did you grow up, and when did you arrive here to spread this unctuous joy? Melbourne, Australia is my hometown. I came to London 10 years ago looking for a job as a pastry chef and found one at St John restaurant. I ended up staying there for four years and definitely discovered unctuous joy in the pastry kitchen. Preserving is a main part of both the sweet and savory section. I really embraced this, but I guess we had to, as once winter came around I basically had no fruit to use except apples and lemons. Knowing that I had a massive Kilner jar of vibrant red raspberry jam in the cellar was like liquid gold. We always kept ingredients pure and respected them so I would never have added spices or flowers to the jams. It wasn’t until I left and decided to make jam full-time that I started experimenting more. Obviously your jam is very special, but what characterises the best ingredients and where do you source your fruits and flavours? I always use the best available fruit and try to taste it before I buy — especially testing for sweetness and ripeness. I really like tart fruit and tend to go for the sour raspberries as opposed to the sweet ones so that it gives the sugar more room. Sweet and tart work really well together; the sugar counteracts the tartness as does the acid counteracting the sweetness; it’s a little balance. I tend to head down to my local wholesale fruit market or ask around to see what out and about. Leila from Leila’s Shop sources really beautiful seasonal fruit for her shop and I will sometimes ask her to get me extra. The quality of the fruit she buys is the best there is, and she personally goes to the market during the night to taste and buy what is in its prime. I really respect that: no compromise. Flavour-wise I tend to grow most herbs I use as you can’t readily buy them. An example would be pineapple sage. 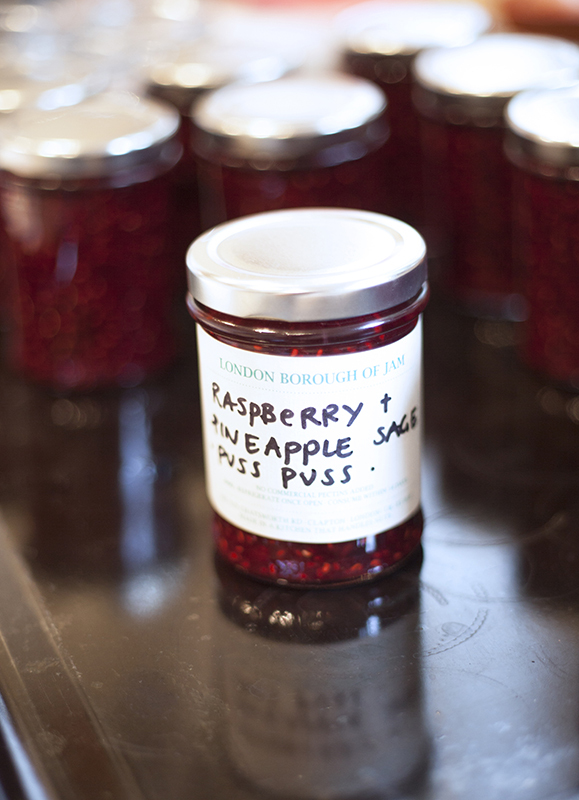 Incidentally, this is what I used in my PUSS PUSS jam recipe (see below). What are the flavours you’re feeling drawn towards for autumn and winter? Autumn is a great time to start making jellies and there’s nothing more rewarding than crystal-clear jellies; I find them really enchanting. You can really play around with all the different flavours like elderberries, blackberries, rosehips, damsons and pair them with the base which will be a strained apple pulp. You can use cooking apples, crab apples or medlars for the setting element. Most people don’t really know what to do with crab apples or medlars, but they are a great base for a jelly that you can flavour with something else. Jellies are also delicious with both meat and cheese. I don’t feel winter as much, but mid-January I start getting excited again as Italian citrus starts appearing and Seville oranges, and then it’s all about marmalade. Blood oranges start appearing and I get excited by the colour. However, unfortunately this is one marmalade I can’t master yet— I can never retain the bright red colour, and this really irritates me so I always give up, I usually give it a go every year though, hoping I might come up with a new idea. We know that you’ve worked as a pastry chef in some fine establishments. Is this where you honed your craft or have you always had a flair for sweet things? I only worked entirely in pastry at St John. The kitchens I worked in beforehand had both sections in one, which is really common. Pastry is usually tucked away in a tiny corner. It was complete luxury working in the St John pastry kitchen and being on my own. The pastry/bakery section was double the size of the savoury and they had three or more chefs during service. I guess working in pastry fulltime helped me become more skilled as if I would fail at something then I would have time to try to get it right and go back to it. There is a slower pace in pastry and more time to iron out the creases. Your shop only opens for a couple of days a week— a truly relaxed cat-like schedule which we wholeheartedly endorse. What passions consume the rest of your days? I never really planned to have a shop. The tiny space became available, and as it was on the next street from my house and still cheap I grabbed it thinking It would be great for storage with the aim of one day building a small kitchen to hold jam-making classes. I’m still hoping to do this next year: open it as more of a storeroom and kitchen with more jam and less of the retail products. We always laugh and call it a gift-food shop. I spend most of the week working on my wholesale business which is what keeps me running. And then a few days making special one-off jams for the shop. I’m currently in the process of an upscale, and moving to a larger production space so that I can try to fulfill orders. I have also been working really closely with a distributor in Japan so that I can start spreading the LBJ love abroad. Your shop feels like a glimpse into your world and the things you love. What qualities do you look for in the products you fill it with? I really love colour and think this is reflected in the shop. When I started fitting the shop out I wanted to have the jam as a bit of a centerpiece— which is why I choose to have plain simple metal shelves so that everyone could focus on what was in the jar and the vibrancy of the fruit colours. Gradually, over the last three years I’ve added more and more bits and it has become a little more cluttered so the jam shelf doesn’t sit so loudly but I still try to fill it up with colourful jam. I also like to travel and find bits and pieces along the way: either bringing them back with me or finding something similar. Chester is very handsome indeed. When did you get him, and does he have any other striking qualities? Chester is nearly seven now. I got him when I was at St John as one of my work buddy’s sister had his mum and dad and they had a litter. I remember Lee asking me if I would want one and that we could make a day of it going to collect him as he was just out of Manchester, hence his name. I remember he cried the whole way back on the train and I was really worried about him. He’s the first male cat I have owned and I have now realized that I prefer males cats; they’re a bit more independent and aren’t as scratchy, well Chester isn’t. He’s pretty chilled out though he likes his routine, food at the same time every morning and evening. I’ve noticed the older he’s getting the more he sleeping during the day but he’s generally really active and extremely territorial of his pitch. We’ve had many trips to the vet. Some people say he’s fat but he’s just a big cat. His best friend is tiny and looks like a kitten but we’ve soon realised she must be full size as it’s been a few years now and she hasn’t grown. Chester lets her eat his food, which is really nice. She has a collar so she’s not starving or feral, just greedy and small. It always make me laugh that his friend is so small and his so big, we call her Cheeky. Does he keep you company while you’re in production mode? Chester doesn’t really like to hang out in the kitchen apart from when it’s hot as we have slate tiles and he likes lying on them. He hates the sounds of tearing aluminum foil and freaks out so he’ll run away very fast. Generally he likes to watch me labeling and boxing jam up; I think he enjoys the repetitive nature and loves watching my hands make the same motions. He’ll sometime lie of his back or likes to rest his head against the skirting boards. We guess that some of the kitchens you’ve worked in can be busy, noisy and well, most un-cat-like. Does having Chester around keep you in a more relaxed frame of mind for recipe creation? I’ve always been really strict about him being allowed to jump up onto any of the kitchen benches and he’s really well trained. Only once I found evidence that he had been on the bench when I found dry chicken wing bones on the floor which had been taken of the window ledge, so I knew he’s been up during the night, apart from that, no way! He is allowed on the dining room table with me which I also use as my desk and it’s spacious enough for both of us. I think he likes to be at the same level as me and watch me typing and writing. 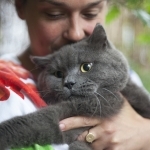 We can’t wait to make this exclusive PUSS PUSS jam recipe you’ve created for us. Did Chester inspire you in any way? Chester always inspires me. It’s his garden that I pick my herbs from and luckily for me, he isn’t territorial about me hanging out there so I am honored he lets me share it with him. The day before you make the jam, tear up fresh pineapple sage leaves into a mixing bowl and submerge them into the weighed out sugar and cover with an oven cloth. This will help the sugar to draw out as much flavour as possible from the herb. 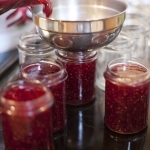 When you are ready to make your jam, wash your jars in warm water and once drained, place on a tray in the oven set at 110℃. Leave these for 20 minutes and then turn the oven off, leaving the jars in there so they stay warm. Place the lids in a saucepan and cover with water, bring this to a boil and let simmer for 3/5 minutes. Turn off. Also, place a small saucer into the freezer (this is to test the jam at the end). 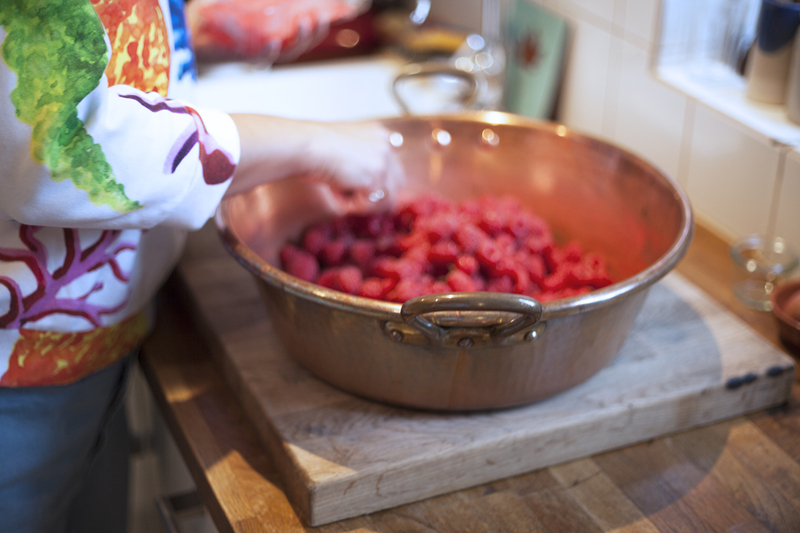 Place fresh raspberries into a heavy base saucepan, I use a traditional copper jam pan but a wide Le Creuset pot would work equally as well for this smaller batch. Turn the heat on and cook the raspberries until they start releasing a little liquid, make sure it’s a gentle heat as you don’t want them to catch. 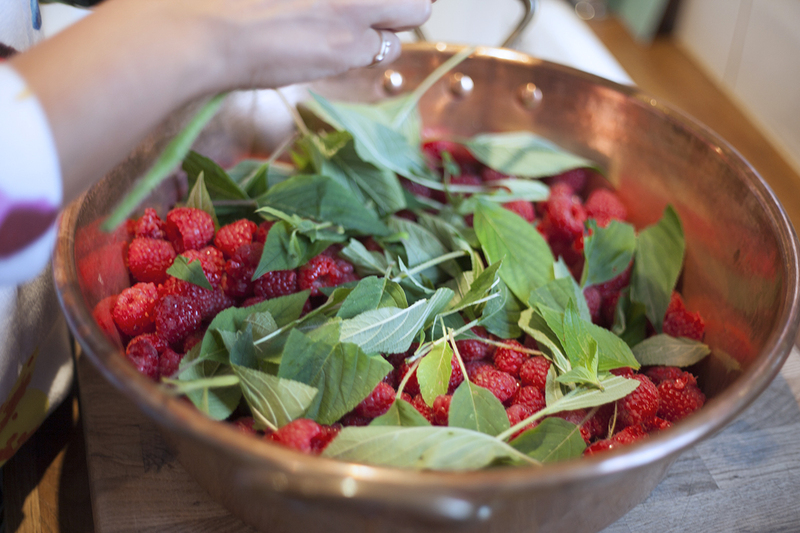 Once the berries start to break down, slowly add the sugar and pineapple sage mix and the juice of 1 lemon. Bring this to the boil for 5 minutes and test according to the ‘plate in the freezer’ method. A spoonful of jam onto a frozen plate should indicate if a skin has formed which is good! Take the tray and warm jars out of the oven and slowly pour the hot jam into them, you want to make sure the jars aren’t piping hot as they might crack, they should be warm to touch. Pour off excess water from the lid pan and quickly seal the jars immediately with warm lids.